I have those moments of rash justification when I tell myself that I HAVE to eat this to make sure it’s ready to share. My accomplice was my 8 year old son, who like a small rodent, took a bite each time he walked into the kitchen. Using Pamela’s mix, this is so easy and really delicious. Preheat oven to 350 degrees and butter sides and bottom of springform pan. Mix berries with 1 T sugar and port and set aside. On high speed, mix butter and sugar together until well blended, about 2-3 minutes. Turn mixer to medium and add eggs, beating until fluffy, about 2-3 minutes. In separate bowl, combine Pamela’s mix with baking powder and whisk to combine. Turn mixer down to low and add Pamela’s mixture, beating on medium until well combined, about 2 minutes. Scrape batter into pan and smooth top with offset spatula. Drain berries, reserving port, and roll berries in 1/4 c. of Pamela’s mix to coat. 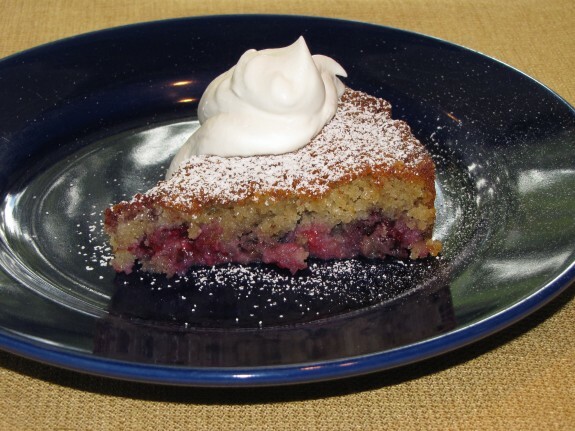 Gently drop berries atop cake and drizzle 1 T port atop berries and batter. Bake for 45-50 minutes until toothpick comes out clean. Cool for 10 minutes then remove the sides of pan. When completely cool, sprinkle with powdered sugar and serve with whipped cream. This is one of the MOST DELICIOUS desserts I have ever had! Who knew gluten-free cake could taste this wonderful? !